Does it surprise anyone that this station uses green as its primary colour? 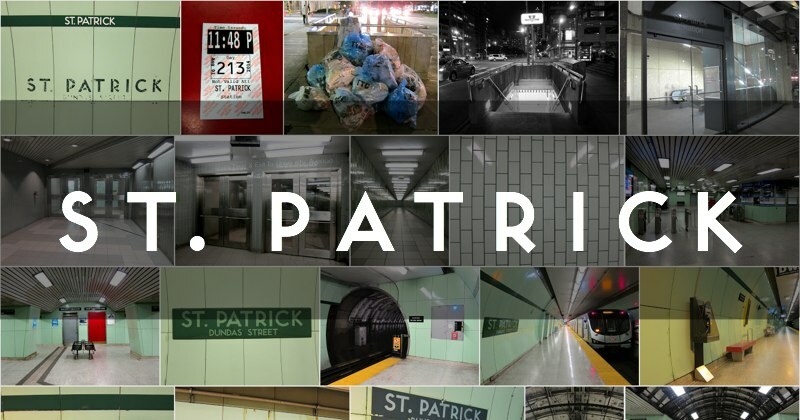 Unlike the majority of TTC stations which take their name from a cross-street, St. Patrick was titled for the one of the city’s original five wards, and the propinquent St. Patrick’s Church; ‘Dundas Street’ consequently appears as a subheading. Opened on February 28, 1963 as part of the then-newfangled University line, St. Patrick puts on a brave front but has run down in appearance. Its charming tubular platforms are plagued with mild outbreaks of rust-stained walls, chipped and peeling paint, and corroded signwork. The same misguided folks who spearheaded the renovation of Museum station also intended to make over St. Patrick (as well as Osgoode), but their optimistic plan for an ‘Avenue of the Arts’ stalled due to lack of funds. As the closest station to the Art Gallery of Ontario, St. Patrick was slated to be victimized by a ham-fisted revamp, but we were spared by the budgetary gods. What the station really needs is a simple refurbishment—back to the original lustrous condition. Can one lose a sainthood? That paint’s a-peeling, not appealing. During my visit, a polite station attendant approached me and stated that photography wasn’t permitted. After I referred her to the TTC’s actual policy (which only restricts commercial photography), I was allowed to continue. Hurrah for preparation! Did you know: St. Patrick station was almost renamed by the TTC, at the AGO’s request, to ‘Art Gallery station’ in 1978, but a public outcry and an emphatic phone call from the chancery office of the Roman Catholic Archdiocese of Toronto prompted the AGO to withdraw their application.